Biblioklept intends a series of posts during 2012 about his bookshelves, and has kicked the project off from his nightstand. As such, a final note on movement: I will move “outward” from this nightstand, photographing any place where books are set. I will photograph every kind of book in this house in its natural habitat; this includes children’s books and cookbooks, but does not include personal photograph albums, instruction manuals, or anything else of that nature. I plan to do 53 total book shelf posts, including this one (there are 53 Sundays in 2012). I love the idea and have decided to take up Biblioklept’s challenge to share my own book shelving habits. Using my iPhone I will photograph all the places in the house where books rest, carrying the project through moving to a new house in the spring. My first photograph is of the stack that sits on my antique oak desk, beside my left-hand speaker. The size of this stack varies greatly depending on what I am reading at a given time. My photographs will move outward from my desk. I’m rereading (for a third time) James Wood’s How Fiction Works, a chapter at a time. David Harvey’s The Condition of Postmodernity and Alice Oswald’s Memorial are recent acquisitions that have yet to be shelved. 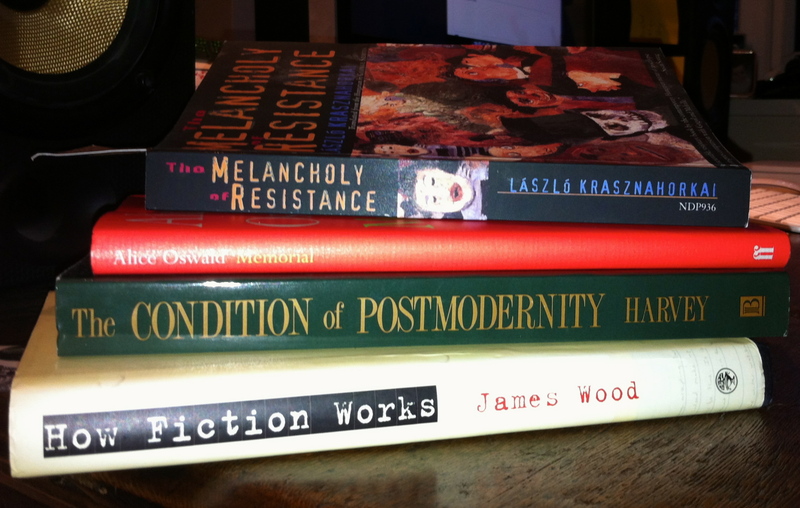 I’m slowly reading László Krasznahorkai’s intoxicating The Melancholy of Resistance.